The General Meeting of the IONA reaffirms the need to allow everyone access to knowledge and proposes three lines of action: Philosophy, Culture and Volunteering, bearing in mind the need to foster civic ethical values for the 21st century. The General Meeting recalls that the purpose of Schools of Philosophy “in the classical tradition” is to educate all human beings without distinction so that everyone can live with dignity and understand their usefulness to society and the world. The IONA recalls that, in order to act effectively in the societies of our times, human beings need to base their actions on organizational structures that provide them with the appropriate tools to solve the new political, economic, social and environmental challenges that face our societies. In this way they can bring about an improvement in human relations, as proposed by the Principles laid down in the IONA’s Charter. The General Meeting reaffirms its intention to continue with the activities of the IONA and to promote its active participation in society alongside other public and private institutions and organizations. The General Meeting recalls that humanity as a whole has resolved to defend human dignity in all places and all circumstances, and it was in this spirit that the United Nations adopted the Universal Declaration of Human Rights as “a common standard of achievement for all peoples and all nations.” The Declaration was proclaimed on 10 December 1948, which means that 2018 will be the commemoration of its 70th anniversary. The General Meeting invites each of the national member associations of the IONA to commemorate this event in the course of its activities. The Meeting reiterates its intention to continue to support the principles that inspire the United Nations, which are also reflected in the principles of the International Organization New Acropolis. 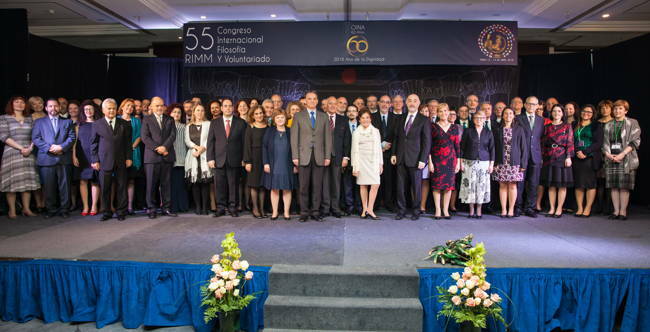 The General Meeting of the IONA proposes to its Member Associations that they continue to establish institutional relations with international organizations having similar purposes and common ground for mutual cooperation. In line with the above, member associations are encouraged to participate in institutional networks of a regional or global nature. The General Meeting of the IONA echoes the appeal made by the General Secretary of the United Nations, Antonio Guterres, in his New Year Message for 2018, in which he issued a “red alert” in response to the deepening of international conflicts, the increase in nuclear weapons, climate change, inequalities, human rights violations, nationalism and xenophobia. The General Meeting of the IONA agrees with the proposal of Antonio Guterres that it is necessary to foster unity in the international community by narrowing the gaps, bringing people together around common goals, bridging the divides and defending shared values in order to “make our world more safe and secure.” The IONA has been working in this direction for the last sixty years, through its more than four hundred and thirty branches around the world, striving for peace, unity and dignity of all human beings in over sixty countries across the five continents. Since its beginnings, the IONA has promoted in its Schools of Philosophy a human rights-based education, so that human beings in every part of the world can know their rights and those of others, and develop a practical ethics of community service. It also proposes continuing to develop and expand the activities of ecological action groups that foster the education of human beings while conserving the environment and providing systems of support and survival in the event of natural disasters.